are sold All the things that go into making good savory dishes –the hand, the heart and the five senses – go into making desserts. 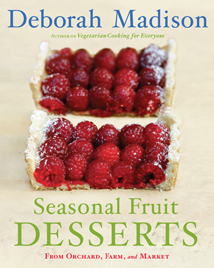 Seasonal Fruit Desserts captures fruit as a means to pleasure and knowledge. I‘ve used the subject of (mostly) fruit desserts to guide readers to the names of stellar varieties, their characteristics, where and when they might be found, and the history of some of our unique American fruits. It also looks at tree crops, from Medjool dates to shagbark hickory nuts, and America’s new farmstead cheeses for the last course of the meal. Seasonal Desserts from Orchard, Farm and Market challenges our ideas about what’s in season by looking at where foods are grown and what their true seasonality looks like. Green rhubarb with blackberries? Of course! Because good fruit speaks so well for itself, these desserts don’t depend on terribly exacting conditions and manual dexterity for success. These are recipes for cooks rather than pastry chefs, meaning they are easily made.